Off-campus today, so if I want “24 hour access” to this article, it will only cost me… Actually, I can’t find out how much it will cost me until I give Wiley my credit card information. Can you imagine any other online retailer trying that? I have no original observations to offer, but I’m disturbed on a few levels. 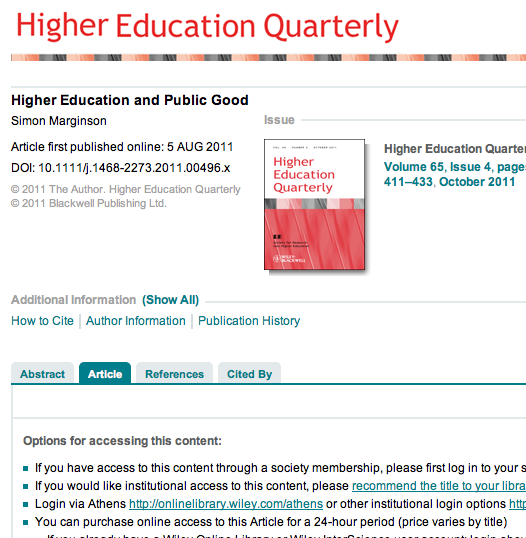 The ironies of publishing a paywalled article entitled “Higher Education and Public Good” are obvious enough. (Thanks to Dean for providing the title of this post.) It’s one of those cases where it seems someone, somewhere is clearly missing the point entirely. The global public space lies mostly outside direct governance, in collaborative networks, non-government organisations and cyber-space, where higher education is helping to build the future global society. …Many universities are good at the one-way broadcast of self-interest, in the manner familiar to capitalist societies. Though most universities neglect two-way flows and flat dialogue, they have the technologies and discursive resources to conduct plural, de-centred conversations. If so the university needs to more explicitly value its own contributions to public debate and policy formation; and in its incentive systems to favour not just the creators of saleable intellectual property but socially communicative faculty. 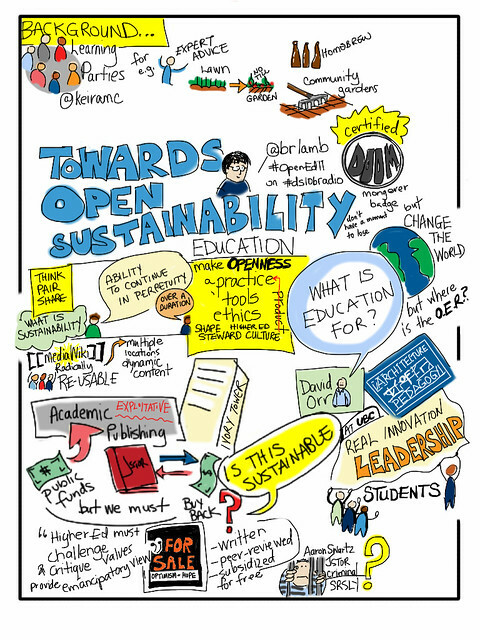 I used up too much of my limited presentation time at Open Ed 2011 ranting about the proprietary barriers around the work higher education performs, which I find especially troubling when it concerns public engagement and the need for urgent public action. It was not one of my more coherent episodes, I’m grateful that Giulia Forsythe took the time to write up and illustrate more lucid versions. What disturbs me most is how rarely I reflect on how powerful the privileges conferred on me are, thanks to the ten million dollars or so that my employer pays in annual licensing fees. When I read “Higher Education and Public Good” on-campus a few months back, I did not appreciate how fortunate I was to have unhindered access to scholarly work. But privilege is often invisible to those who possess it. If I take my role as a “public servant” seriously, might I be obligated to take direct action to free up these resources to the wider world? Knowing that sort of action will be dealt with harshly. Related and better reading: Jon Beasley-Murray has posted the text of his rich, passionate and erudite keynote at last month’s Access 2011 conference. And Martin Weller is his usual sensible self in his recent post, Yeah, but who pays? Both of these pieces deserve posts of their own, and I’d like to delude myself into thinking I will write them someday. I was just at the Ontario Council of Educational Developers, many directors and sundry from teaching centres here in Ontario Universities and I wonder if your ears were burning. I liberally reapplied your indignation and asked where Ontario was in this. Many did not even know what open access was so it was helpful for me to reference your presentation. I’m glad you are revisiting this. Now I’m off to check those other references. Oh, last point, which is not germaine to the argument, because it should be open and available to everyone but – UBC doesn’t have off campus access to library journal databases???? How do your online learners access materials? Is it different scenarios for students, staff, faculty? Yes, Giulia has a point… It doesn’t make up for the general shame of closed-access publishing, but you should be able to gain access to the UBC access with your regular log-in, eh? Yes, there are ways to access the UBC periodicals off-campus. For whatever reason, my VPN didn’t work, and after a few minutes of poking round for the EZ Proxy link I decided I didn’t want to look at the paper anymore. Open vs proprietary access is creating a nice new sub-genre of ironies. We have a journal called Open Learning which put an 18 month embargo on self -archiving. Oh, and part of me longs to not be the sensible one, to have someone say “Martin is his usual wild, demented self in this post”. But try as I might, I’m just too damn straight. And sensible. And what does it say when the people calling you Captain Sensible are so securely lodged in the lunatic fringe?